Adrian’s youngest daughter, Pearl says her father is “addicted to love.” The Third Wife is about the Wolfe family, two ex-wives, five children ranging in age from five to twenty-three, and the new wife. The family goes on vacation en masse. They get together for holidays, recitals, and all sorts of life events. The older children from the first marriage love and adore their younger siblings from the second marriage. And everyone genuinely appears to like one another, even the exes. Adrian and his third wife, Maya were trying to have a baby. Their marriage ended when an intoxicated Maya was hit by a bus at three in the morning. 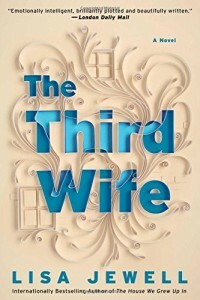 As Adrian grieves his late wife, he begins to realize that things are not what they seem. He discovers that Maya had been receiving horribly critical emails from an unknown person. The knowledge the sender had is very intimate. Could it be one of his children? Or maybe it was Jane, the woman who answered his ad about adopting Maya’s cat. The mysterious Jane has been seen all about London. Adrian attempts to find Jane and discovers she wasn’t really Jane. As Adrian spends more time with his children and ex-wives without the buffer of a new wife, he learns about himself and his children. They are not the perfect creations he has always considered them. And he is not the perfect father he thought he was. I am giving The Third Wife four and a half stars. I found the story provocative, intriguing, and entertaining.